Edward Reeves took his first studio portrait in 1855. Today his great-grandson Tom takes photographs in the same studio on Lewes High Street. The Reeves Studio is thought to be the oldest continuously operated photographic studio in the world. Its archive of over 100,000 glass plate negatives with relating paperwork is both a unique and living record of the daily life of this market town and the history of photographic practice. There are roughly another 100,000 photographs on film and shot digitally. The archive is of international significance, and important in the history of commercial photography. The original ledgers and account books allow us to caption, date and locate any of the 100,000 glass negatives, and identify the subjects, customers and their addresses. Brigitte Lardinois, Senior Research Fellow in photography and Deputy Director of the Photography and Archive Research Centre of the University of the Arts in London, is working with the Reeves family on the cataloguing and preservation of this archive. They are developing a long-term strategy to make this valuable historical resource accessible to the wider public and researchers. Brigitte is applying to the Heritage Lottery Fund for a grant to enable the photographing and transcription of the existing ledgers and account books, in order to map what is in the archive and help prioritise the digitising of the negatives. The result of this work will be a public website with selected images in a good enough resolution to aid research. Brigitte hopes to do this work with the help of groups of specially trained local volunteers, and she may be turning to the Lewes History Group for such assistance. In October, Brigitte and colleague Matt Haycocks will be curating an exhibition of images from the Reeves archive for the Brighton Photo Biennial 2014, titled Stories Seen Through a Glass Plate. 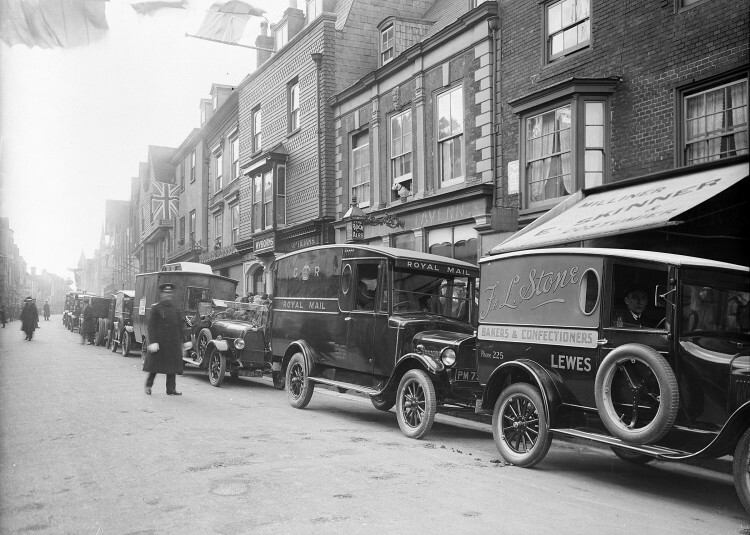 Archive images will be displayed as light boxes in fifty shop windows along Lewes High Street, near to the location where they were originally taken. The historical images will be juxtaposed with the present townscape, and will bring the work to a wider public. This ‘outdoor’ exhibition will make a trail from Lewes railway station up Station Street to the bottle neck and down to the bottom of Cliffe. In addition, there will be exhibitions at the Reeves Studio and the Barbican House Museum, organised with Emma O’Connor, Curator of the Sussex Archeological Society. There will be maps and information available from the Tourist Information Centre, and Viva Lewes is planning a special issue on photography to coincide with these exhibitions. The event runs from 4th October until the 2nd November.